This section is for beginning the ontologist and business user. 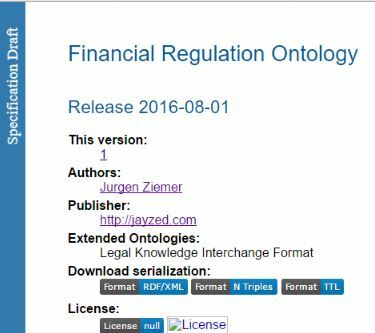 To get an understanding of the Financial Regulation Ontology it is best to look at both schema and data. The schema documentation – definition of classes and properties. Browse the FinRegOnt.com, ontology documentation. 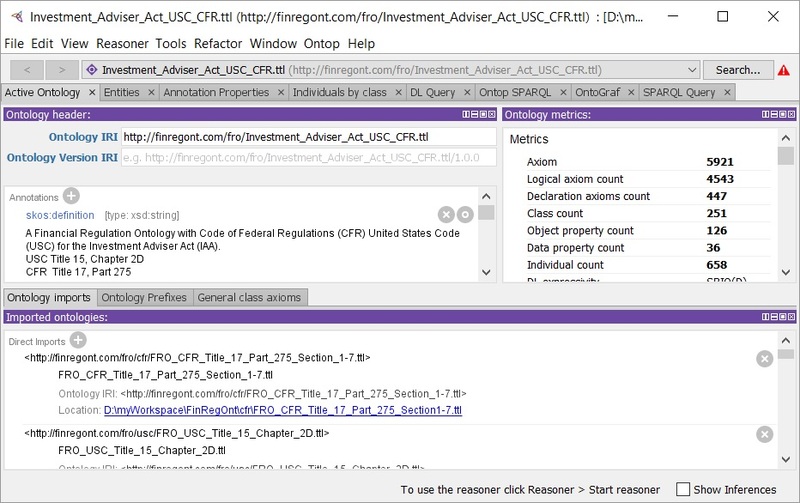 Examine the Web-Protégé project: http://webprotege.stanford.edu – Financial Regulation Ontology. 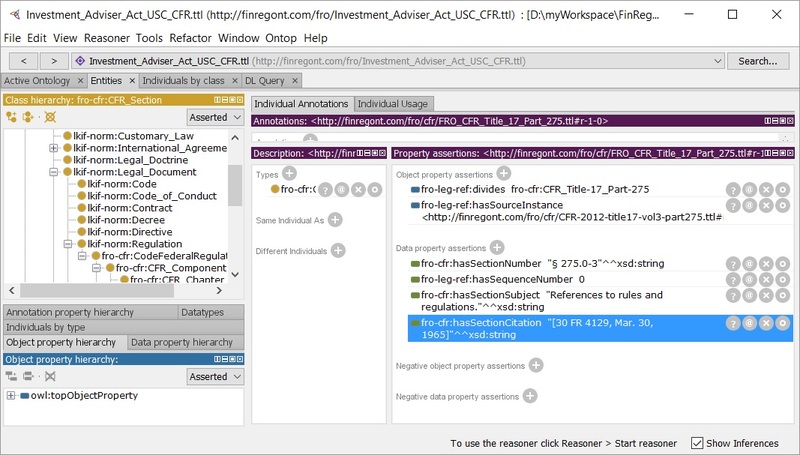 The root ontology file http://finregont.com/fro/Investment_Adviser_Act_USC_CFR.ttl Is a good starting point. It is populated with sections from the Code of Federal Regulations and United States Code relevant the Investment Adviser Act. The tool loads the Investment Adviser Act ontology file and recursively all included ontologies. This may take a few minutes depending on your download speed. 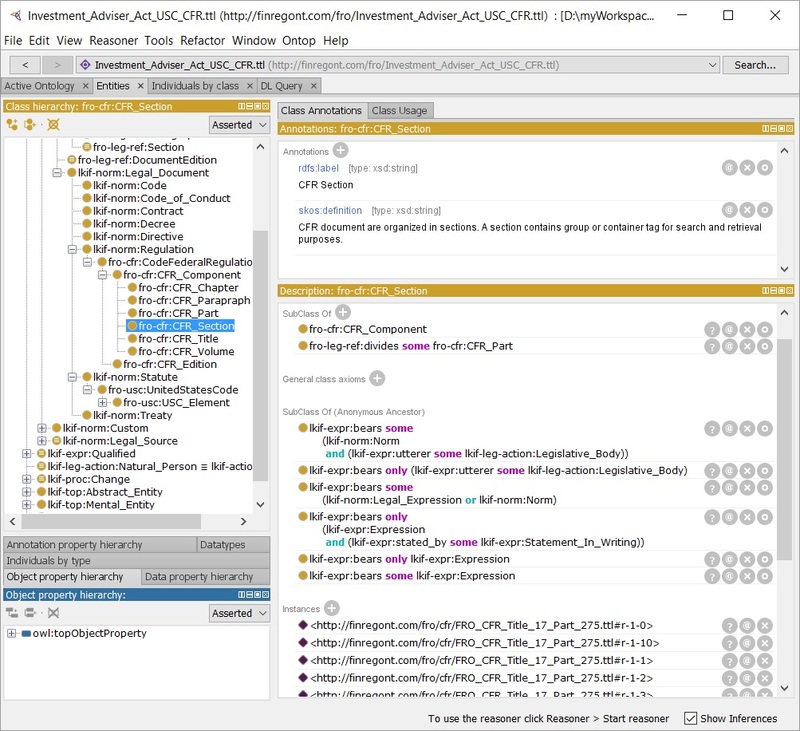 The active ontology tab displays header information, statistics and the list of includes. Click the Entities tab to look at the classes. The entities tab has a navigator window for the class and object hierarchy. Note that all top-level classes (directly under owl:Thing) are LKIF. Financial Regulation Ontology extends LKIF with United States Code (USC) and Code of Federal Regulation classes. We will see FRO subclasses of LKIF in the next pages. Tip: Regulatory Document classes are lkif-expr:Medium. Lawmakers, supervisors are lkif-action:Agent. Expand the “+” sign in the Navigator to drill down. Ontologies LKIF, FIBO and FRO are broken down into modules. The modules contain OWL files. A file will define a namespace for triples defined in the ontology. The prefix abbreviates the namespace. 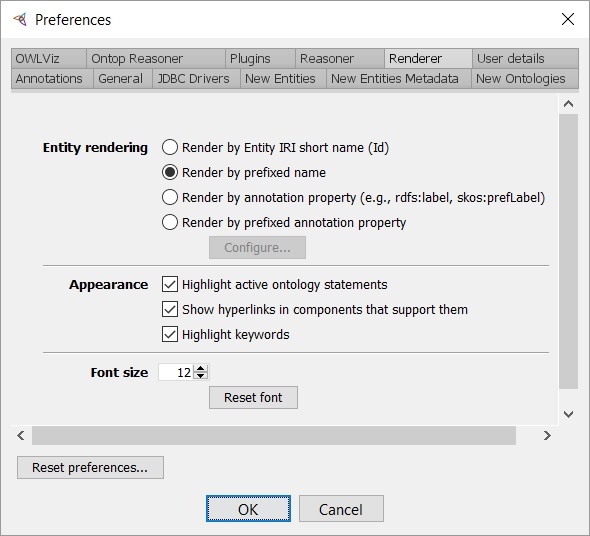 In Protégé select File->Preferences, Render tab and “Render by prefixed name to display the prefix for the Class names. The ontology is “lkif-”, “fibo-” or “fro-”. Navigate down lkif-expr:Medium to expand fro-cfr:CodeFederalRegulations and fro-usc:UnitedStatesCode. The Code of Federal Regulations is a LKIF Regulation; the United States Code is a LKIF Statute. The defined classes fro-leg-ref:DocumentEdition and DocumentComponent enable generic queries on compliance documents. Drill down and select CFR_Section. The Annotations window shows the class label and definition. 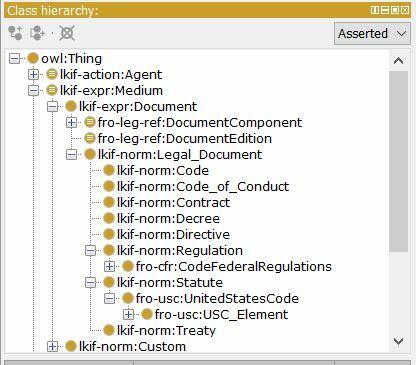 The Description window defines CFR_Section as a subclass of CFR_Component and the anonymous class “fro-leg-ref:divides some fro-cfr:CFR_Part.” The Code of Federal Regulations is a hierarchy of Title, Chapter, Section and Paragraph. The divides object property positions Individuals in the hierarchy. The SubClass of (Anonymous Ancestor) axioms inherited from lkif-norm:LegalDocument place the regulation in the wider legal ontology context. It bears a Legal Expression that is a Statement in Writing made by a Legislative Body (the US Congress). 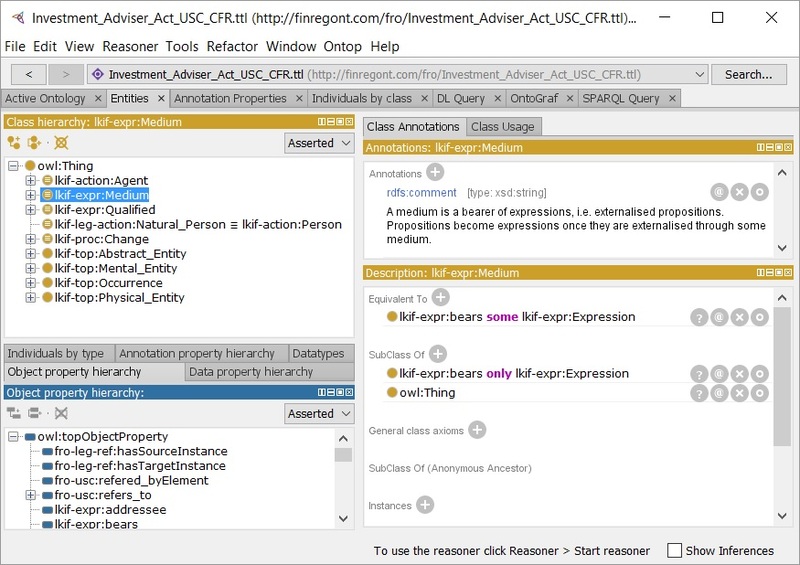 The Property assertions tab shows Object and Data properties for the section individual. The Section divides Part 275 of the regulation. The fro-leg-ref:hasSourceInstance property links to the original record in the XML import for this section. Section Number “§ 275.0-3”, Subject “References to rules and regulations” and Citations “[30 FR 4129, Mar. 30, 1965]” as defined in CFR. Sequence Number is system generated by the XML import. It is simply the order of elements in the CFR XML file. We use the property to ORDER BY.